In this Kitchen Nightmares episode, Chef Gordon Ramsay visits Luigi's D' Italia, Anaheim, California where Luigi opened the restaurant with the help of his father, his brother Tony stepped in to help and they argue frequently. The restaurant is in $1.5 million of debt and can only survive another month. Gordon is pleased to be in a family run restaurant and Luigi introduces the family who soon break out into an argument. Gordon orders the five cheese ravioli, the mahi mahi fish special and linguine pescatore. He is not impressed by the food and tells Luigi that he has been cooking the same food for too long. Gordon arrives to witness a dinner service, the food is sent back to the kitchen, Luigi walks out and Tony goes after him to talk him into coming back. The next day Gordon sits the family down to watch a team meeting, they are not happy with the quality control, the tension within the family and at Grace for starting arguments. Gordon takes the family into the kitchen for a cooking lesson, together they make sausages and it is clear that Luigi is starting to getting his passion back. Gordon shows them a message from their father encouraging them to work together and they vow to work together moving forward. Over night, the restaurant is given a makeover and the menu is changed, they sample the dishes and are happy with them. On relaunch night, the dining room is packed. The food leaves the kitchen quickly and the diners are happy with the food. At one point the communication breaks down and the food comes to a standstill but Gordon talks to them both to get them working together and the evening gets back on track leading to a successful relaunch. Over the next few weeks, Luigi's receives a great review from the local OC newspaper and is regaining it's good reputation in the neighbourhood. Luigi's is still open and Luigi reports that business is up 40% since the show aired. Yelp reviews are mixed whereas Trip Advisor reviews are mostly positive. We are so excited to announce we are finally open! Our hours are Tuesday - Friday 11am-10pm Saturday and Sunday 12pm-10pm We will be closed Mondays for maintenance and food prep. Our new address is 1032 E Bastanchury Rd Fullerton 92835 It is a smaller express location for mostly takeout orders but we do have a few tables to dine in. We look forward to seeing you soon! Planning a visit to the restaurant? Check out their website for opening hours and more info. 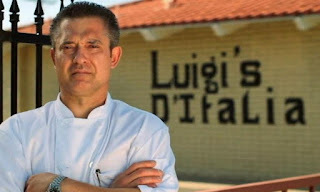 Luigi's D'Italia was aired on October 14 2011, the episode was filmed in July 2011 and is Kitchen Nightmares season 5 episode 7. Seriously no one wants to be yelled at by the staff. Why didn't Gordon acknowledge this? All she was saying was 'Lies, Lies, Lies" they had it on bloody video! Chef Ramsey seems to shy away from confrontation when it actually might be harmful to the person's well-being. She was so distraught when confronted, there was little to be gained by rubbing her nose in the proof. She may have been saying it was all lies, but she knows the truth. I think you may be a bit too dismissive of her mood. I had dated a bipolar borderline lady for many years, the break downs and sudden mood swings almost perfectly mirror my ex in a way that gave me flash backs. Pushing these people further doesn't help them, you need to calm them down to help them regain control. Tony's comments were ignorant and inexcusable...but I think he only said them to create a united front with Luigi vs. Gordon as a common enemy. Obviously he could have done so without being a silly bigot. Calling Ramsay English is an insult. He's Scottish. He's dual nationality, born in Scotland, raised in England. I have eaten at this restaurant quite a few times. I really enjoy the food. Luigi is a great guy. The first time we went he seated us and took our order personally. He is friendly and very easy to talk to. His brother Tony is totally cool too. Very very friendly and always smiling. However, Luigi's wife is very strange. Out of the many times my family and I have been there she was friendly to us once. For the most part she looks mad. I am always afraid to ask her for more water or an extra napkin. Like I mentioned before the food is good so we do not let Luigi's wife keep us from returning. If she is there we just say oh well...let's eat!! That's a serious problem, though. You wouldn't keep on a member of staff if they were flipping out at the guests every other day, and the same should be true for anyone who works there, Owner's Wife or no. There is a level of professionalism and integrity that needs to be maintained at restaurants, and Grace screaming like a banshee whenever someone gives her or someone she cares about criticism of any sort is simply unacceptable. No one wants to go to a restaurant where they're harassed, and if you are afraid to even ask for more water, they do not deserve your money. Make it painfully clear to the owner: either your mental patient of a wife goes, or your customers do, and you literally can't afford the latter, so I suggest you get your wife comfortable at home, or your restaurant's about to sleep with the fishes. They have moved to Fullerton now. The food is phenomenal and the atmosphere is calm and inviting. Much smaller place with a few outside tables. Glad they put this stupid show behind them! WE LOVE THE FOOD! I agree with you they are totally different than on TV. If anyone has dealt with reality TV they do everything they can to push buttons create stress and cause drama. Don't believe all the hype about them being crazy. Grace is very kind if you put in the effort to get to know her.